Students with ADHD can benefit greatly from behavioral interventions that are sensitive to their processing style. An individualized plan that emphasizes stimulating reinforcers on a consistent basis has a good chance of success. Consequences and reinforcement should be as immediate as possible. Changing the reward periodically is usually necessary. A major consideration in forming an effective behavioral plan for ADHD students is assessing what is workable for the classroom teacher on a regular basis. Some plans that require extensive charting do not succeed because the teacher can not follow through effectively within the context of the daily classroom demands. Keeping the plan simple and flexible is the key to success. Establish routines and notify the child well ahead of time if there are to be changes in the daily routine. This will help the child to focus better. Your student may need a place to unwind and reduce stress during the school day. Often times this can be simply providing a place for sitting alone, using the computer, taking a short walk, drawing, or modeling with clay. After ten to fifteen minutes, your student will likely be able to access the energy needed to attend to the classroom. Report any significant changes in behavior or school performance to parents, school administrators, or school psychologist. Students using medication to treat attentional problems will have their optimal attention effects for methylphenidate 45 minutes to 2 2 hours after medication. Other medications differ, and it is best to check with the physician about the time of maximum medication effects. If possible, it is best to schedule the most attention demanding tasks for the student during this medication window. Tasks can also be modified to improve opportunities for optimal attention. Students with attentional problems can benefit greatly from behavioral interventions that are sensitive to their processing style. An individualized plan that emphasizes stimulating reinforcers on a consistent basis has a good chance of success. Consequences and reinforcement should be as immediate as possible. Changing the reward periodically is usually necessary. A major consideration in forming an effective behavioral plan is assessing what is workable for the classroom teacher on a regular basis. Some plans that require extensive charting do not succeed because the teacher can not follow through effectively within the context of the daily classroom demands. Keeping the plan simple and flexible is the key to success. Students with attentional problems generally respond poorly to institution wide/classroom behavioral systems. Programs such as Assertive Discipline usually provide difficulty in that rewards/consequences are delayed and not tailored to the individual student’s needs. 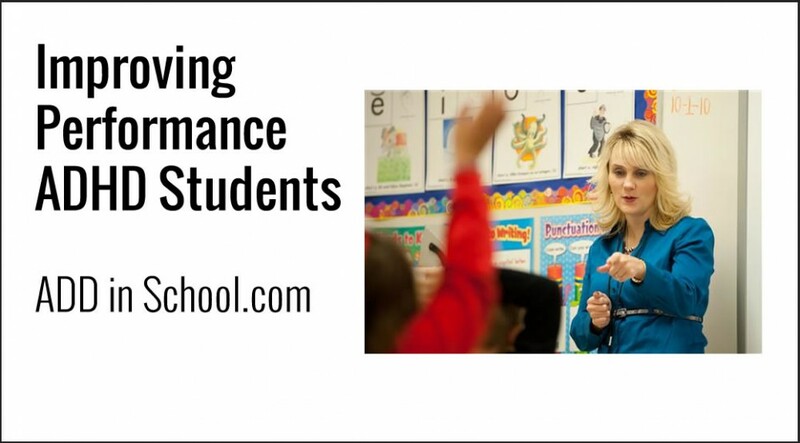 Whether or not there is a formal behavioral program for all students, your student’s benefit from an individualized approach, in which target behaviors are specifically identified and rewards/consequences are fairly immediate. Rewards and verbal praise on a continual basis will change the attentional problem the most effectively. One suggested system is the “point system”. Feedback that is delayed or variable is problematic in that your student may have difficulty in correlating delay and gratification. Your student may begin to make faulty behavioral connections in these situations. Students respond well to rewards that they experience as highly stimulating. Computer games, artistic media, and action based play (sports or other physical activity), building sets, and activities outside of the school setting, can be effective. Ask your student what he would like to earn. Your student is the best source of identifying the reward. Rewards should be changed frequently to maintain their “novelty power”. An effective system for immediate reinforcement and highly stimulating rewards is a “point system”. Students earn points for accomplishments of: 1) achieving prearranged goals that have been discussed and agreed to by the student, teacher, and parent, and 2) any valued activity or behavior that occurs spontaneously during the school day. Point values are assigned to various tasks/behaviors. Teachers have the flexibility of increasing point values or giving any assignment/activity a point value. Points are accumulated and “cashed in” on a reward menu. Points can be added on a continuing basis for a running total kept with the teacher/student. This menu can be a hierarchy of reward activities such as extra computer or playground time to out of school activities, such as lunch or bowling, for an accumulation of many points. The student is in charge as to when to “spend” their points. This system is designed to enhance the delay of gratification for students. It is important in any behavioral system that your student finds early success to “buy in” to the program. One of the characteristics of attentional problems is the variability of work performance across settings, tasks, and over time. Rather than take high performance on some tasks as an indicator that low performance on other tasks is due to low motivation and willfulness, it is important to understand this as the nature of attentional problems. Your student will do better on tasks he finds inherently interesting and stimulating. He will tend to do worse on tasks that required sustained attention and are more mundane. Your student may have difficulty with tasks that require complex problem solving strategies. There is continued difficulty with the “executive processes” (strategies that are used to organize and monitor thinking and action). He may tend to persist using strategies that have proven ineffective. Although your student may seem expansive in using oral language, he may be limited in producing ideas in written form. Assignments that require extensive fine motor skills are difficult. Give seat work one sheet at a time, if possible. This will prevent your student from feeling overwhelmed. This is also a helpful technique in testing him. Identifying your student’s goals with his involvement is effective. Goals should begin by being simple and easy to understand. Two to three goals are sufficient to begin any goal attainment intervention. The criteria for success (or earning points) should be simple and clear. Successful goal attainment early in the process is critical. Ask your student to generate possible goal areas or have him choose from a menu that the teacher has created. The larger the role that he has in identifying the goals, the greater investment he will have in reaching them. Have someone actively monitoring your student during tests, especially multiple choice, fill in the “bubble” tests. He can get off track and fill in the wrong places or become so frustrated that he might answer at random to simply complete the test. Emphasize that part of the work routine is to “check your work”. Students tend to complete work and turn it in without checking it over. Give the student some instruction in how to check his work and practice it with him. In assignments that require research reports and creative writing, have the student dictate the words to someone rather than writing it down. The student can then copy the words using the word processor. This technique will yield greater output on tasks requiring expressive written language skills by removing the written component.